Saturday, July 21: The first Giant Swallowtail of the second brood was seen on July 17 by Mary Montsch. Several fresh Giant and Spicebush Swallowtails were seen today. The first Northern True Katydid of the year was heard this evening. Tuesday, July 17: The 14th annual Windsor butterfly count was held on Saturday, July 7. See the count page for the full results of this year's count. We have also added two PDF documents to the web site. a summary of past counts and a page on attracting butterflies. People may see a female hummingbird at Ojibway's feeders sporting a bright pink spot on her forehead. This hummingbird was banded at Ojibway on June 30 by Carl Pascoe and Rachel Powless of the Holiday Beach Migration Observatory. Another trapped female turned out to have a band! She was a recapture from last year at Ojibway. She weighed in at 3.3 grams and had a brood patch indicating she is nesting. She was banded on June 6, 2006 as an After Hatch Year female. This is an interval of 370 days. She would have to be at least in her 3rd year of life and we hope to keep finding her for years to come. 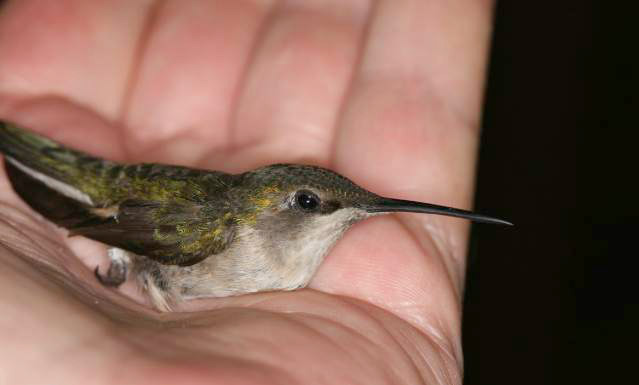 She is the first documented retuning Ruby-throated Hummingbird in the Windsor area.